There's so much to do in the Brazilian city of Curitiba, it's almost unfair to limit a list of top attractions, that's how much there is to do. Hopefully, your travel planning and the city's reliable bus system will allow you to enjoy as many of these places as you can. Designed by architect Domingos Bongestabs, the striking Wire Opera House (Ópera de Arame) is a round structure built in steel and covered with transparent polycarbonate. To reach the theater, visitors must cross a bridge over a lake. The opera house is surrounded by lush vegetation and waterfalls in an area that used to be a quarry. Espaço Cultural Paulo Leminski, named for a Curitiba poet, is an open-air, 5175-square-foot stage whose acoustics benefit from a 90-foot tall rock wall. In the historic district, you can view constructions from the nineteenth century, such as the Red House (1891), or older, like the Church of St. Francis, which dates back to the eighteenth century. Casa Romário Martins, considered the oldest in Curitiba, is a tourist information center today. Memorial de Curitiba, a cultural center which houses art exhibits, plays, and musical presentations, contrasts sharply with the historic buildings around it, including the Red House, an 1891 construction to which it is connected. On Sundays, there is a craft fair in the historic district. Besides having a treasure trove of native plants, the Curitiba Botanical Garden is also known for its greenhouse, made of iron and glass and inspired by London's Crystal Palace. The garden's official name —Jardim Botânico Francisca Maria Garfunkel Rischbieter — celebrates a pioneer urbanist who greatly contributed to the urban planning of Curitiba. Other attractions are the Botanical Museum and a cultural center with works donated to Curitiba by artist Frans Krajcberg. Curitiba's restaurant district has a strong Italian heritage. Eat well and enjoy a glimpse of early Italian immigration in a district dotted with vintage homes such as the Culpi House, the Geranium House and the House of Paintings, which has original frescoes on the walls. At the Italian Woods (Bosque Italiano), the Italian community has typical celebrations such as the Chicken, Polenta & Wine Festival in July. Santa Felicidade is also a great place to see Paraná's symbol tree — Araucaria angustifolia, a relative of the Monkey Puzzle Tree which is called araucária or pinheiro-do-Paraná (Paraná pine tree) in Portuguese. The Batel district's restaurants and bars include the award-winning Batel Grill, a top choice for Brazilian churrasco, and Le Voleur de Vélo, which has a cool, bicycle-oriented vibe and serves great caipirinhas. 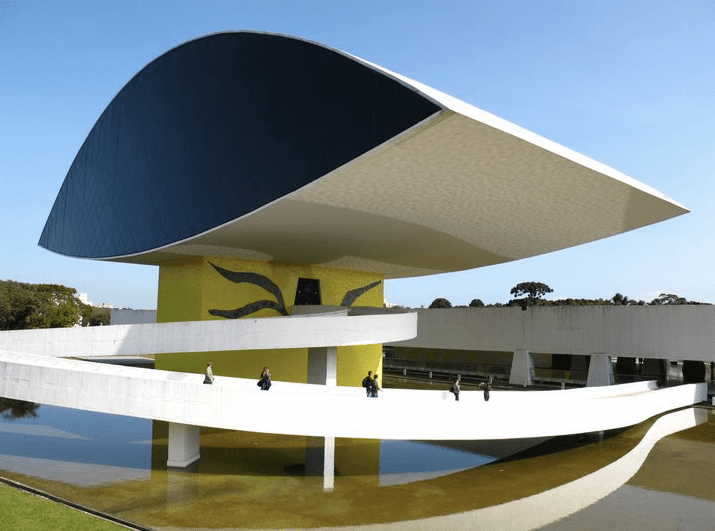 If you enjoy art and would like to experience one of architect Oscar Niemeyer’s masterpieces firsthand, you shouldn't miss the Oscar Niemeyer Museum in Curitiba. Set against the verdant Pope John Paul II Woods, the museum occupies two buildings, both designed by Niemeyer: a sprawling construction in straight lines dating back to 1967 and the Annex, built in 2002 and commonly known as the Eye. Artists from Paraná and other parts of Brazil have their work represented in the museum. Three rooms in the Eye are dedicated exclusively to photography. Compare the structure of the Eye to another Oscar Niemeyer project — the Contemporary Art Museum MAC in Niteroi. The 360-foot tall lookout tower allows travelers a 360° view of Curitiba and has a telephone museum on the ground floor. It is closed on Mondays. At the end of the nineteenth century, more than 20,000 Ukrainians immigrated to Paraná. At the memorial park in Curitiba, you can visit a Ukrainian wooden house and a replica of the St. Michael the Archangel ​Church in Mallet, a town about 143 miles from Curitiba. You can also buy souvenirs. Dedicated to Holy Mary, the Basilica — whose official name is Catedral Basílica Menor de Nossa Senhora da Luz de Curitiba — is located at the Praça Tiradentes, the city's historic berth and heart. A marker on the square signals the geodesic center of Curitiba. The cathedral was built between 1876 and 1893 on the site of an earlier church. Curitiba has 30 shopping malls, but if you only have time to visit one, choose Shopping Estação. The name of the mall — "station" — comes from the restored train station that houses it. Besides 180 stores, eateries and a bowling alley, the mall has a train museum, a pharmacy museum, a puppet museum, an interactive nature exhibit and an interactive fragrance center. One of Curitiba's greatest attractions is the building known as the Avenue Palace, the headquarters of HSBC Bank. But the best time to see it is during the Christmas season when the bank-sponsored choir for underprivileged kids performs. Listening to the children, live or on TV, as they sing Christmas carols standing at the building's many windows has become a holiday tradition in Brazil. Curitiba is a green city. You can tell from its urban planning and environment-friendly policies, initiated in the 1970s by Mayor Jaime Lerner, and its parks and bosques, or woods, the best of which celebrate the city's multicultural heritage. At Bosque Alemão (German Woods), don't miss the Philosophers' Tower, with a great view of Curitiba. Kids will enjoy Hansel and Grethel's House. Parque Tingui, named for the area's original indigenous people, has a Ukrainian church memorial; walk on mosaics and among pillars which honor the Portuguese heritage at Parque de Portugal; see Polish wooden houses at Bosque João Paulo II, visited by Pope John Paul II in 1980, and relax with local families at Parque Barigui. One of the best train rides in Brazil, the scenic Curitiba-ParanaguáCuritiba-Paranaguá train ride is an attraction in itself. It's also one of the departing points to Ilha do Mel, or Honey Island, one of Brazil's most beautiful islands. There are boats to Ilha do Mel from Paranaguá.